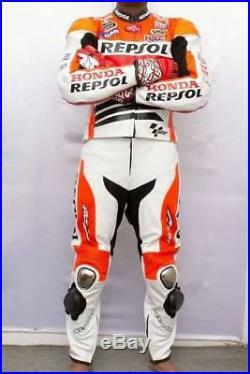 Men Orange Red Repsol MotoGP Honda Racing Motorcycle Leather Suit Jacket Pants. Any custom changes you want is possible please send message for further details. Ducati suit made up with 100 % Genuine Top Quality Cowhide Leather. Ducati suit with Original YKK Zippers. CE Approved Safety Pads. Jacket has Back Zipper to Attach with Pants….